Humanity stands on the verge of a new era, but it needs the help of the galaxy’s greatest ever scientist. But Davros is dead… isn’t he? From the bunkers and shelters of ancient Skaro to the gleaming Domes of the Future Earth Empire, Davros has always been a man of destiny. Now he’s working for mankind’s benefit. But how much do we really know about Davros? Has Davros really turned over a new leaf? The Doctor certainly doesn’t think so. But is the Doctor always right? Colin Baker is the Doctor in…Davros. The Daleks are the most iconic and famous foe of the Doctor. But what of their creator? Born on Skaro, transformed by war, scarred by bombardment and left for dead, a brilliant, ruthless scientist created the ultimate weapon; a new race without emotion, without pity, clad in tank like “travel machines” based off his own life-support chair. Thus were born the Daleks, the most dangerous and feared race in the known universe, the children of one megalomaniac – Davros. 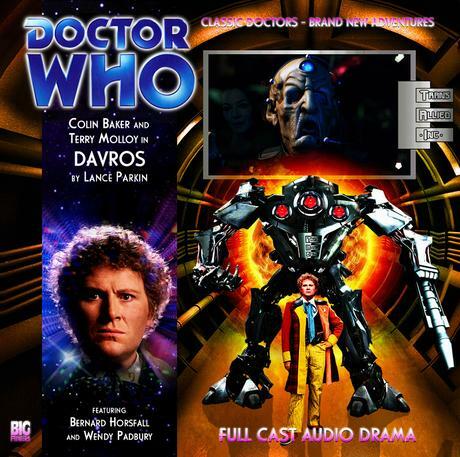 Davros is the second of Big Finish’s “Villains Trilogy,” where the Sixth Doctor and Davros collide in the most unlikely of circumstances, first working together, than facing off against one another with the fate of the entire galaxy at stake. Thanks to a incredibly strong script and one of the best acting performances so far for Big Finish, Davros is nothing short of an instant classic that not only defines the villain for new listeners, but adds several different layers to the iconic figure without watering him down in the process. …for the sole purpose of hiring the infamous scientist to work for their corporation! When Davros finally shows his true colors (I’m really not spoiling anything here, am I? ), Molloy’s cackling and his demands for obedience are sharp and direct, while casual his dismissal of the dome’s population as they die of radiation poisoning is perfectly in character. And it’s all the more better for the listener, because even though they know from the beginning that the moment is coming where Davros begins to implement his master plan, they’ve had to wait over sixty tense minutes for it. There was only one choice as to which Doctor would be portrayed opposite Davros. The Fifth Doctor would have been swayed by Davros’ words about redemption, while the Seventh Doctor would have already had a plan in place from the very beginning. The Sixth Doctor, however, is a bit more cynical and as just as insanely brilliant as Davros is coldly logical. Colin Baker’s scenes opposite Terry Molloy in Revelation of the Daleks were some of the best of Colin’s run on television. 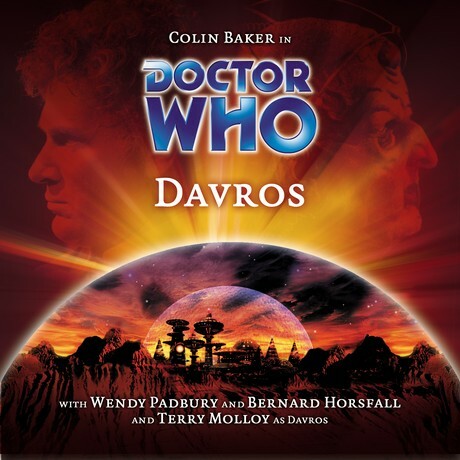 The same holds true in audio format; most of Davros is nothing more than the Sixth Doctor and Davros having a conversation, with Baker downplaying some of the more manic aspects of the Sixth Doctor (this story takes place early in his regeneration, soon after The Two Doctors, as Peri is still his companion, but off-screen at an interstellar botany convention, a great touch by the writer) which helps to avoid overshadowing Molloy’s performance. While Six still has his moments, such as the early scene where he pleads with his colleagues to be quiet, only to leap into an apoplectic state and run charging towards the Baines the moment he sees Davros’ dead body or his repeated attempts to circumvent the Personal Assistant “given” to him by TIA, the focus is really on the screen time he shares with Davros. You can hear the disbelief in his voice as he listens to Davros explain why he’s trying to turn over a new leaf, but it’s quiet and scoffing as opposed to a loud sarcastic laugh…much in the same as Davros’ rough scratchy rasp is his mockery of the Doctor’s comments. Even in the scenes away from Davros, such as exploring a shut down assembly line or dealing with an active nuclear device, Baker is in top form. It’s just yet another run-of-the-mill superb performance from Colin Baker, once again showing why he’s the best of the audio Doctors. It’s a smaller supporting cast once again, and with one exception, each are absolutely stellar. That exception is Eddie de Oliveira as the reporter Willis, and it’s because he’s just a bit TOO believable as a journalist; cynical but naive, trusting yet paranoid, subtle yet blunt, helpful yet lacking in tradecraft. By his character’s demise, he’s little more than a talking plot device serving to show the ruthlessness of Andrew Baynes. Veteran character actor Bernard Horsfall (who also starred in The Mind Robber, the War Games, and Planet of the Daleks plays the CEO of TAI. In any other serial, Baynes would have been the perfect villain; smooth talking, calm and reasonable, a motive for profit behind every action, always serving the bottom line even at a human cost. Horsfall and his gravelly tones play Baynes as friendly, almost grandfatherly, but in that Rupert Murdoch sort of manner where you’re always looking for the catch in the deal or the knife in your back. The name Wendy Padbury is familiar to longtime Who fans, as she played the genius companion Zoe Heriot during the end of the Second Doctor’s run. Lorraine Baynes shares a sharp intellect with Zoe, but with a sharp, steely edge. She’s interested in Davros from a historical perspective, and writing her part as a “revisionist historian” is a solid choice on the part of the author. Someone who twists history around to its “correct” form, often to serve her husband’s corporation, Padbury’s conversations with Davros serve to give insight into the villain in a casual, academic manner. Until Davros begins to massacre the inhabitants of the dome, at which point she fails to come to grips with the evil she’s helped to unleashed. But by the end, she’s already figured out how to rewrite what happened, and absolve herself of all blame in the process. Padbury deserves credit for playing Loraine completely different from Zoe, someone who lets other people get their hands dirty and refuses to blame herself. Ruth Sillers also deserves credit for playing the brave Kimberly Todd, who contacted the Doctor in the first place and set the whole chain of events in motion. Confronted with Davros’ evil and trapped with him during the climax, she goes from timid computer programmer wondering if she’s doing the right thing to sacrificing herself so the Doctor can attempt to stop Davros without worrying about her safety. Lance Parkin is very familiar with the Doctor, having penned several novels along with the Big Finish audio Primeval. The script for Davros is original and refuses to water down Davros or make him sympathetic. The script adds several dimensions to the character through flashbacks, touching on both his time before being caught under Thal and his work afterwards. We meet several of Davros’ colleagues, including Shan, from whose blueprints Davros created the Daleks after removing the weakness known as emotion. From the very first flashback, Davros’ utter ruthlessness and determination to survive is in full display. Loraine presses him during their time together about Shan and whether or not Davros cared for her, but the listener is never sure if Davros had any emotion towards her, or was just using her as a means to an end, calling for her execution when she was no longer of use to him under the guise of her lover being a Thal spy. The same goes for his time talking to the Doctor. Davros insists his imprisonment has caused him to reconsider his genocidal ways, and even as the Doctor shakes his head in disbelief, the listener has to wonder if Davros is indeed telling the truth. He studies the galactic famine (which is a nice lead in to Davros’ machinations in Revelation of the Daleks) and the universal economy and believes he has a solution to both of them…but Andrew Baynes isn’t keen on putting the entire galaxy on a war footing. Is it the rejection of Davros’ plan that causes him to seek vengeance against TAI? Or was Davros’ plotting to take control all along? 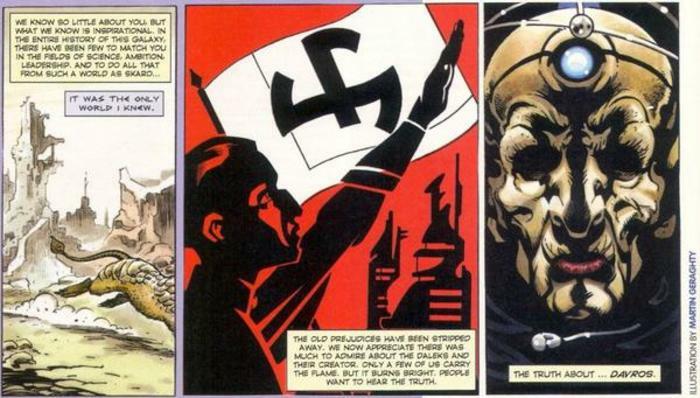 Davros’ master plan, the way he plans to become the supreme power in the galaxy, is a very neat little McGuffin, something that makes perfect sense in the day and age of “too big to fail” and Wall Street bailouts. And the way he plans to exterminate the Doctor using a nuclear weapon is the perfect level of Davros-esque overkill, complete with some of the best mad cackling in any format. Out of the three serials that make up the “Villains” trilogy, Davros is easily the best, and a story I could listen to again down the road. Omega saw the writer attempt to put the Doctor and Omega on the same level as flawed creatures, ignoring the Doctor’s attempts to do good vs. Omega’s attempts for personal power at any cost, and Master contains a plot point that flies against the very nature of the Doctor that ruins the whole thing. But Davros deserves praise, especially for Lance Parkin’s script and Terry Molloy’s performance. They both add to the legacy and backstory of Davros, but without rewriting his very nature, or completely changing the foundation of his relationship with the Doctor. The first episode sees the Doctor and Davros working together on a project at TAI’s request, a great way to get the two in the same room without trying to kill each other and outlines their volatile past to a new listener as well as providing a few moments of light humor mixed in with serious conversation as they examine what they are to each other. Davros might be the Doctor’s greatest singular enemy, and the Doctor might be the closest thing to a friend Davros knows. By the end of the story, Davros is still a threat to the known universe, but instead of seeing him in a “he’s not so bad” light, we have a better understanding of what makes him tick, and why that makes Davros just that more dangerous. Next up – Many years ago, on a dark and stormy night, the disfigured and enigmatic Doctor John Smith invited his closest friends, Inspector Victor Schaeffer and his wife, Jacqueline, to a dinner to celebrate his birthday. A few hours later all the occupants in that house had been changed, ­some were dead, others mentally scarred forever by the events of that night. This entry was posted in Big Finish Review and tagged 5/5, Big Finish, Colin Baker, Davros, Doctor Who, Sixth Doctor, TARDIS. Bookmark the permalink.